The Old Stile Press :: News & Work in Progress: A one way trip to Bloomington, Indiana! For more than thirty years at The Old Stile Press we, Frances & Nicolas McDowall, have been working with artist/printmakers to produce books of great beauty, hand printed in limited editions. Full details can be found at our website (link below) but we hope that our friends will visit here regularly to see what is going on at the Press. A one way trip to Bloomington, Indiana! These have been really exciting times for us here . . . but first I must indulge in a little history. When I was a junior editor in London, at the start of my (commercial) Publisher's career, I was already an avid hunter for books - of different sorts but especially for Illustrated Books and the productions from Private Presses. If I had a free lunch hour, I could just get to The British Museum with enough time to see exhibitions and such like but otherwise there were (then) a number of really great bookshops within reach in that part of central London and I would almost run to one or another to have as much time there as possible before more or less running back. No time for actual lunch, you notice, or a sandwich on the hoof at most. One of my favourite places to go was the emporium of Bertram Rota. This wonderful photograph is of one of their 'homes' but, although it was a long time ago, I cannot claim to have known them in those illustrious days. This was Bodley House and I think the photograph was taken in 1964. 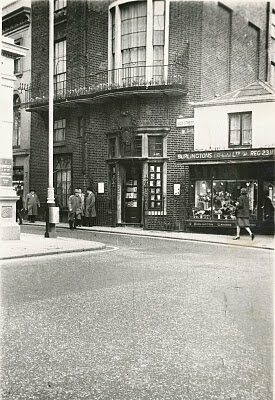 For those who know London, the flower shop next door is at one end of Albany and it was in that famous and fashionable apartment complex that Bertram Rota started. By the time I came on the scene, as a shy book lover embarrassed that I was always gazing at the glorious tomes laid out in their glass cases but never buying anything, Rota had moved again . . . but not far. The road in the photograph above in which the photographer seems to be standing, and which shoots off in the direction of about 8 o'clock, is Savile Row (from which I have never bought a suit!) and it was to there that they had moved in my time and where I plucked up enough courage to visit. I begin to print and we have books to publish. In the early days, the indefatigable Frances tramps round the streets of London with a case of books hoping to get booksellers to stock them. Not easy then and pretty well impossible now! 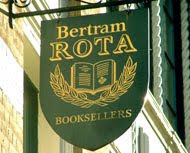 At Rota, however, she enjoyed an increasingly warm welcome until, over the years, the shop (now moved yet again to Long Acre) were happy to hold a complete set of those of our books still in print. They did us a marvellous service, of course, by showing the books to visitors to London, especially from overseas. At this time, our great ally at Rota's was Anthony Rota (son of Bertram) and the antiquarian book world lost a giant when he died last year. Now at the helm is his son, Julian, and with him we come up to date and the start of this current little saga. Decades ago, when Libraries and Museums had pots of money for acquisitions, we heard that a number of egregious Private Presses had had their Archives purchased and borne away to this Library in America or that Museum in the UK. If I had been asked the question, I would have thought that in today's dire financial climate, there would be little money for such activities. HOWEVER, and here I finally get to the point, Julian Rota contacted us some months ago and asked whether we would like him to try to 'place' our Archive in this way - he being adept in this activity. We were amazed but said yes please and privately thought it a bit of a fantasy. As usual it was mostly Frances who undertook the searching for files and packing boxes (I was busy writing and laying out on my computer our second Bibliography - but more of that later) but eventually the day came and here are some snaps to remind us of the day when we waved all those boxes away to America! I need hardly say that we feel enormously proud at this development. Indiana may be a bit of a step away from The Wye Valley but we know that our stuff will be in amazingly good company. 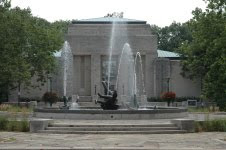 The Lilly Library owns an early Gutenburg Bible, MSS by Burns, J.M.Synge and James Barrie (Peter Pan, I think) and the Archives of Sylvia Plath, Ezra Pound, Orson Welles among many others. Can't be bad! The Library also has the right to purchase future tranches of material relating to the Press' activities . . . so we had better just get on with it! Congratulations to you both, Nicolas and Frances, and bravo to Julian Rota and to the Lilly for this excellent match-making. At The Old Stile Press, we design, print by hand and publish books in limited editions. These involve texts, new or reprinted, together with wood engravings, woodcuts or linocuts. As our starting point for each production is a desire to work with a particular artist-printmaker, our books often differ greatly one from another. An almost theatrical initial impact and a specific and appropriate 'feel' for each book are important to us. Our work has always been 'hands-on' and is entirely bounded by our capabilities, enthusiasms and energies. Nicolas designs and prints the books, working closely with an artist and sometimes with an author, where the text is a new one. Occasionally he is himself author and/or artist. Frances is the Press's link with the outside world. As often as time allows, she makes paper on which some of the books are printed. This occasional Journal is intended to give a glimpse of what is going on at the Press and especially what is being printed and what is being planned for the future. It is also meant to link firmly with our WEBSITE (click on link below) where full details of all our books can be found. Quince . . . lovely word, lovely jelly!